‘AWICS’ provides a wide range of training opportunities through regional seminars, in-house training sessions and webinars. Our principal trainer is Adrian Waite. All our trainers are selected not only for their professional qualifications, knowledge and experience, but also for their ability to explain complex and technical matter to a wide range of individuals. We are constantly expanding the range of training opportunities that we offer and the range of clients that we serve. Delivery: Our regional seminars are held in venues in Scotland, Wales, London and the regions of England and address a range of topics of relevance to those with an interest in public services including local government and social housing. All our regional seminars are also available as in-house courses. 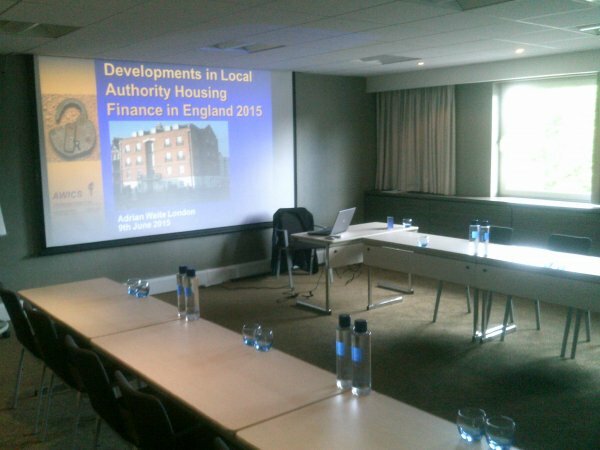 Topics offered: The annually updated ‘All You Want to Know about…’ series is designed to provide an introduction and overview of key topics, such as Local Authority Housing Finance, Service Charges, Local Government Finance, and Housing Association Finance. We provide separate versions for England, Scotland and Wales. Past attendees: Those who have attended our regional seminars include local councillors, chief executives, chief officers, housing managers, board members at housing associations and arms' length management organisation, tenant representatives, accountants, property surveyors, lawyers, journalists, police civilians, civil Servants, lecturers and students. Delivery: These in-house courses follow closely the format of the regional seminars but are tailored to the specific requirements of the client by using local data and emphasising matters of importance locally to the client. Topics Offered: Our range of in-house courses is more extensive than our range of regional seminars. Our offer includes training opportunities in subject areas such as Local Government, Housing Finance, Housing Management, Management Skills, Management Issues, Performance Management and Personal Skills. Past attendees: Organisations for which we have held in-house courses include government departments, local authorities, housing associations and arms' length management organisations in England, Scotland and Wales. Our aim is to provide high quality training that is relevant to the needs of our clients. We always seek and welcome feedback and consistently receive positive feedback from clients. Our Mission Statement is ‘Independence, Integrity, Value’ and this is reflected in our training courses being based on objective information, good quality delivery and good value for money.